It is crazy just how much nail polish my girls and I have. In fact, we have a whole drawer dedicated to just nail polish. We have many different colors and brands. 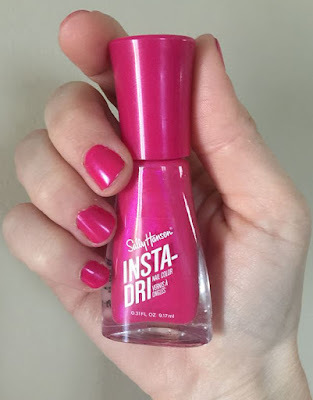 With summer here, my girls and I were thrilled to have the chance to try the newly updated Sally Hansen Insta-Dri Nail Color in Flashy Fuchsia. This 3-in-1 formula with built-in base and top coat offers shiny, extended wear in a single step. New and improved Insta-Dri 3-in-1 formula provides 33% longer wear and chip resistance versus old formula. As the #1 quick-dry polish in North America, Insta-Dri is formulated with a base and top coat for extended wear and full-coverage, streak-free shine. Dries in 60 seconds and requires just a single step. The first thing I noticed was the new sleek design of the bottle. I love how easy this bottle is to grip while you are applying the polish to your nails. The applicator offers a wide brush design which is great for my bigger nails, but does tend to overlap onto my skin with my smaller nails. This isn’t a big deal I just have to angle my applicator or do a little cleaning around my nails when I am done. I am really impressed with how in one stroke your nail has complete coverage, with the vibrant color offered and no streaks. It is really nice not having to apply several coats to get full coverage to get the look that it is intended to offer. Your nails dry sooo fast. They are dry to the touch within 60 seconds, perfect for my girls. We can paint our nails and go. This nail polish does seem to last longer than other polish’s that I use. However, if you are doing a lot of cleaning, gardening, or getting your hands wet it will start to chip, although not nearly as easily as the other brands I have used before. I am a huge fan of everything about this nail polish. It has great color, only needs one coat, dries superfast, and lasts longer. What more could you ask of nail polish? Where to purchase: You can make a purchase from local retailers in your area and online. Disclosure: I was compensated for this post with a product to review by a PR agency or company for my honest opinion. Regardless, I only recommend products or services I use or would use personally and believe will be good for my readers. Your opinions may vary from my opinions. Links in the post above my contain affiliate links. You can also go here and read my PR and Disclosure Polices.